Is Continuum juggling too many plots for its own good? Continuum's second season continues to blow me away. Every episode has been fantastic. But at the same time, I keep suspecting that this show doesn't really have a coherent mythos, and all this complexity will eventually collapse under its own weight. Friday night's "Second Wave" provided a bit of evidence. 1) The Liber8 terrorists were sent back in time to prevent the rise of the corporate dystopia of 2077, but they've had a schism after Sonya was ordered to kill Travis and take leadership. Now Travis is in charge of all the gangs in Vancouver (although the gang leaders are already plotting against him, especially now that his military CMR got activated, causing him to act crazy.) Meanwhile, Sonya has rejected violence, although she's still trying to take political control by backing mayoral candidate Jim Martin. And I guess Sonya is/was following some plan of Kagame's, which is why she shot Travis in the first place. But it's all kind of unclear. 2) And now there's a third Liber8 faction, because Julian Randol, who grows up to become the terrorist leader Theseus in the "original" timeline, is running his own Liber8 cell, separate from Travis or Sonya. Julian, too, appears to have rejected violence as a solution — when he has the chance to shoot Kiera, he lets her go instead. 3) But it gets more complicated, because another member of Liber8, Lucas Ingram, is seeing the "ghost" of Curtis, the psycho killer who died back in season one. Lucas also appeared to be seeing the "ghost" of Kagame last week, but maybe that was just him pretending? In any case, Curtis is either back from the dead or is appearing via some kind of brain implant. Or something else. In a possibly related development, there are some scenes back in 2077 where Travis goes to see Curtis in prison and tells him that they will have a sort of life after death — but is Travis referring to their execution becoming a time travel adventure, or what's happening now? 4) And meanwhile, the time-traveling "freelancers" who haven't really done much up until now are suddenly super-active. Not long ago, they stole the bodies of Curtis and the other dead Liber8 member from the morgue, along with Kiera's dead former partner. Now, they're trying to nab living time travelers. They go after Kiera, managing to shut down Kiera's CMR using a device that is apparently from further in the future than 2077. 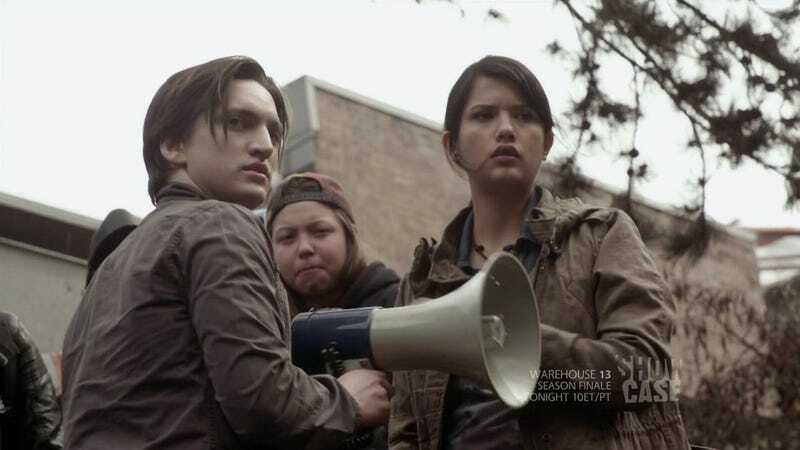 And they grab Garza after she escapes from the Vancouver PD, where she's held for most of the episode. 6) Meanwhile, Kellog, who was already stymied in hiring a future whizkid because Escher snapped him up first, is trying to take on Escher. He tries to convince Sonya to join him in the anti-Escher crusade, but then he also spies on Escher as he crashes Alec and Emily's date. And apparently sees the evidence that Emily is working for Escher — which hopefully he'll use in some especially devious manner. 7) But also, while Garza is being held by the Vancouver PD (who hold her in the same precinct where they do everything Liber8-related, and also don't seem to know about a huge escape route in the middle of their own headquarters) she tells Kiera that Old Alec explained Kiera's purpose to Garza. That is, why Old Alec chose Kiera, in particular, to go back in time. But Garza doesn't share this information with Kiera, and it's not clear whether she's just playing the Protector. 8) And finally — I don't think I'm missing anything — there's some development of the Alec/Kiera relationship. Alec forgives Kiera for almost shooting Alec's step-brother (and standing by while Julian got tortured as well.) And Kiera says she'd be lost without Alec — who apparently feels as though he owes Kiera something because his future self sent her back in time in the first place. Which is a good point. 9) Oh, and there's the dangling plotline about Jason, who may or may not be Alec's father. But we didn't deal with that this time around. This was a fun episode, and I appreciate that this show is so fast paced and full of twists and turns — Continuum is not letting any grass grow under its feet at all. And there were some neat, fairly subtle, points in this episode. Like, the reason Garza is able to escape from custody at the Vancouver PD is because Dillon orders the security cameras turned off in her holding room, to allow first Kiera and later Badkopovitz to rough her up. And that lack of surveillance allows her to get her cuffs off undetected and get the drop on Badkopovitz. And there were some neat character moments in this episode, including the Alec/Emily romance and the Alec/Kiera moments. Also, Alec activating Travis' military CMR was really neat — and it was fun to see how that interface looked different than Kiera's. I also appreciate the fact that this show doesn't really have any throwaway characters. Pretty much everybody is getting something interesting to do, and a real arc. But I'm also sort of resigned to the notion that the huge overarching storyline about Liber8 and the freelancers and changing the future won't wind up having a good landing, because there are too many moving parts and there are already lots of little indications that important stuff is being lost in the shuffle. (For example, Kiera deciding that she no longer wants to preserve the future she comes from is a huge big change, and it's been sort of skipped over.) I hope I'm proved wrong — but I just don't know how this show can keep all these balls in the air and still catch them all in a satisfying manner.